10753 views on Linkedin : how much traffic on our website ? Home » Misc. 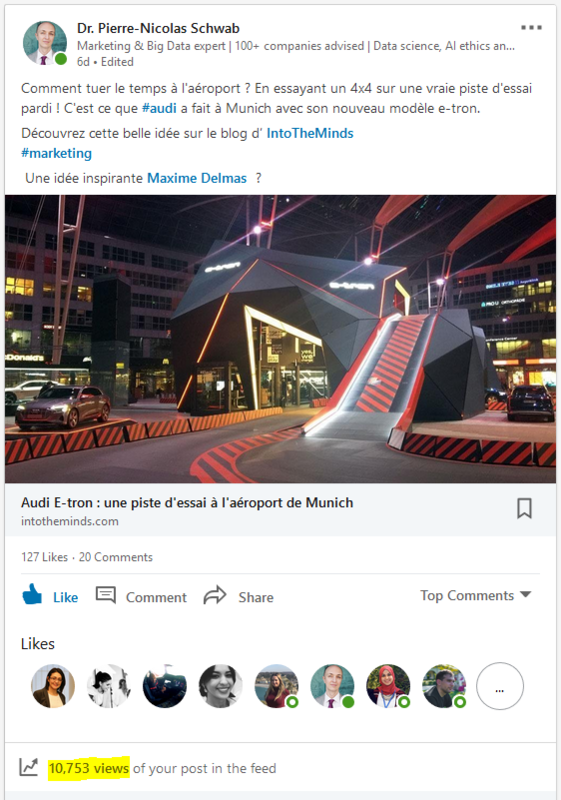 » 10753 views on Linkedin : how much traffic on our website ? I’m about to bust a myth : popularity on social media is not the key to drive traffic to your website. As you probably know I’ve been blogging for 12 years and have published some 3500 articles so far. Some are short, some are longer, some are very long (apparently it’s good for SEO) but as a rule I always try to pack as much value as possible for my readers. Today I’d like to tell you the story of an article that went viral last week and reveal how much it changed to my website traffic. On March 8th I published a very short article, actually one of the shortest I’ve ever published. This article was mainly made of pictures and I simply reported in less than 200 words on a creative idea I spotted at Munich airport. I posted it on Linkedin and suddenly it got massive number of likes, comments and reshare. I made the screenshot below on March 15th at 11 am and as you can see it had been seen already 10753 times. This is my best score so far on Linkedin. But how many of these views actually got converted into clicks ? Scroll down to find out. How many Linkedin views did convert into real traffic on my website ? I extracted the pageviews from the google analytis panel and as you can see the article’s popularity (measured in pageviews) quickly dropped. It went from 129 views on Day 1 to 49 views only on Day 2 (well it was a Saturday which is usually the worst day of the week in terms of performance). When breaking don the numbers by source it became much more interesting. In total this article got 238 pageviews, 150 of them from Linkedin. And now comes the truth. The 10753 “views” on Linkedin resulted in 150 real pageviews on our website, a mere 1,39%. Next time you get a popular post on Linkedin, calm down and remember that 98,61% of those “viewers” actually didn’t engage with your content.